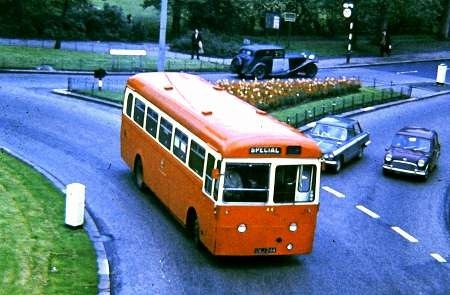 My Thanks to Ian Beswick for contributing the above excellent shot of this Rochdale Corporation AEC Swift with its Seddon body who also supplied bus bodies under the name of Pennine. The Swift was AECs move into the rear engined single decker market. It first appeared at the 1964 commercial motor show and there were two versions a low frame for bus work and a high frame for coach operations. Operators also had the choice of either the 16ft 6in wheelbase for a vehicle length of 33ft or 18ft 6in for a 36ft vehicle. The high frame version allowed for luggage to be stored in underfloor side lockers due to the fact that the rear of the vehicle housed the horizontal six cylinder diesel engine. Yet again there was a choice of two engines the AH505 ?? litre or the AH691 11·3 litre. London transport acquired several 36 ft 11·3 litre Swifts which they called Merlings (MB) for some reason best known to them, but the manoeuvrability was poor so the shorter version (SM) were acquired but due to the shorter length they had to have the AH508 8·2 litre engine which rendered them well under powered. 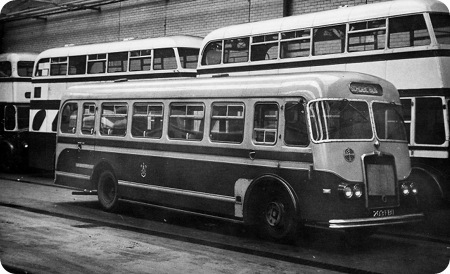 When AEC first announced its rear-engined single deckers, there were to be two models, the medium-weight Swift with the AH505 engine (33ft or 36ft), and the heavy-duty Merlin with the AH691 (36ft only). London Transport ordered their Merlins at that stage. By the time the two models went into production, they had been harmonised to such a degree that AEC renamed them Swift 505 and Swift 691. But LT always persisted with the original names. Can someone give technical information on the Swift Chassis, like its length, weight, width and other information? The Swift was the first joint production with Leyland after the 1962 "merger". The main chassis frame, and other components, were common to the Swift and the Panther. The engines and axles were unique to each respective model. There was a 32’6" (AH505) model (Leyland was the Panther Cub with 0.400 engine). There was a 36’0" long (AH505 or AH691) model (Leyland was the 0.600 Panther). All were 8’2½" wide. 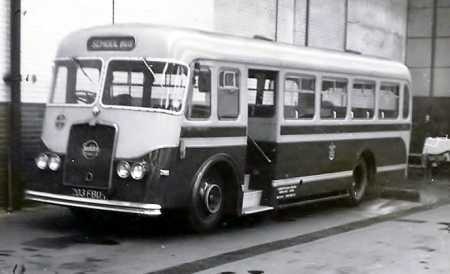 There was the most common bus version with a lower front frame and the high frame model intended for coach work. In the event, no AEC Swifts were built with high frames but there were a number of high frame Panthers, some with 0.680 engines. Does anybody by chance know the weight of the AEC SWIFT AH505 Chassis? I once worked with a former London Transport engineer, who told me how Merlins were constantly being reported for defective engine stops. Quite often the true explanation turned out to be that the awful engine had worn its cylinder bores oval, so the bus was actually burning its own sump oil which was leaking past the piston rings! No good cutting off the diesel if that isn’t what’s burning…! And, I once attended a Traffic Commissioner’s hearing in Southampton where Bill Lewis, then General Manager, responded to a question about the Southampton Swifts by saying: "If only someone would make me an offer for them!". Not one of AEC’s best efforts! I had a couple of holidays in South Australia in the mid 90s where I saw many ex Adelaide Swifts in various guises. Their were some in a yard at Port Adelaide being converted for further use. In Port Pirie the local bus company had about 6 in use. There was one on town service in Port Lincoln. One at Port Kenny as a caravan which had a Hino engine a popular conversion with mobile home conversions. A further mobile home in North Adelaide. Another in Woolaston near Gawler. In a Marina at Port Adelaide I found one in use as a support vehicle for a film company who had four more in stock for the same purpose all still with their AEC engines, one of which had just returned from filming a documentary in the out back doing many miles off road. I read a couple of years ago the some Swifts had been refurbished and sold to a mining company on an island in Indonesia for staff transport. All this info suggests that the poor reputation of the Swifts might be unjustified. Happened on this site purely by accident. In no way consider myself a bus enthusiast. Rootes Classic cars are my scene. But many of the photos on this site have stirred up some vivid childhood memories from growing up in Alkrington, Middleton on the 17 Manchester / Rochdale route. Like – how immaculate the Rochdale buses on this route always were. Loved the blue/cream livery and the deep blue seats. AND on this route were Lady Conductors! Unheard of in Manchester. As a 10 yo I developed a hopeless crush on one particularly pretty chatty girl and it was a thrill when she came along to issue the ticket. Yes, the 17 has a very long history and as a bus service it has the longest possible history of using the same number in Manchester, as it dates from the introduction of route numbering in 1930 although at that point it was an express service from Bacup to Flixton. It took its current form in 1932. Whilst there are several routes that have remained essentially the same for many years, the 17 has avoided being renumbered in all that time. The 24, by contrast, is a comparative youngster, as it dates from the acquisition of the Yelloway service from Manchester to Rochdale at that time. Another route 17 (and 18) is that of Portsmouth Corporation (and successors’) tennis racquet-shaped route from Dockyard-Eastney-Dockyard. It lasted, unchanged, for about 82 years, until a major re-arrangement of services brought its demise last year. I used to live in Rochdale & remember the 17 that ran to Manchester, both Manchester Corporation "Red" & Rochdale Corporation "Blue Bus". The buses had a peculiar idle sound, where the engine would rev up then coast, never settling at a constant speed until driven off. Can anyone tell me what this was? Was this a design feature or a worn engine? Also what make were they? I seem to recall "AEC" & "Leyland" on the driver’s steering wheel but I’m not sure if these were the type of buses in question. I’ve heard sound samples of Routemasters (the only type I’ve identified recently) but they seem to have a normal idle sound. I live overseas now so can’t research this in person. Thanks in advance. Mike, I think that the distinctive engine sound you heard probably relates to Leyland buses of the late 40s/50s. Leyland engines of the period often had pneumatic rather than mechanical governors fitted to their fuel injection pumps (usually supplied by CAV or Simms and both offering a choice of governor type). The fitting of a pneumatic governor gave rise to the characteristic ‘hunting’ at tickover, and other vehicles with this fitment and idling characteristic which spring to mind are the 4-cylinder Ford Thames Trader, and 4-cylinder underfloor-engined Albion Claymore lightweight trucks. The Claymore’s Albion EN250H engine was also fitted to the Albion Nimbus and Bristol SU psv chassis. Personally I found the ‘rise and fall’ tickover quite endearing, especially on Bradford City Transport’s Leyland Titan PD2s, which gave the impression of "contented mechanical purring" when idling. 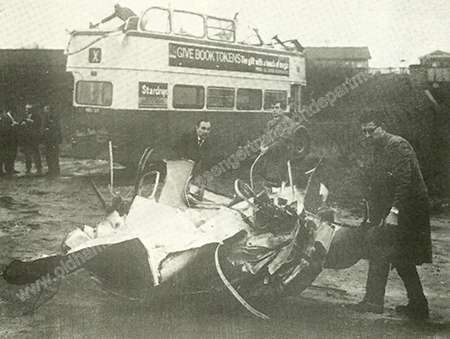 I don’t know how these Pennine bodies fared on the AEC Swift chassis (or on the Lancashire streets) but we had two almost identical bodies on 33ft Fleetline chassis, also G registered, at Halifax which fell to pieces. Portsmouth had 12 Pennine single-deck bodies on double-deck Leyland PDR2/1 Atlantean chassis, delivered in 1971/72. This followed deliveries of 26 Leyland Panther Cubs and 12 AEC Swifts, with a mixture of Marshall and MCCW bodies. At that time I was only an occasional visitor to Portsmouth, but I remember the Panther Cubs and Swifts as sometimes seeming rather sluggish in pulling away, but the Atlantean saloons being strong performers. However, the bodies really shook, rattled and rolled! It is of interest, though, that after the MAP project in 1981, the Corporation withdrew all the remaining Panther Cubs, all 12 Swifts, and 14 newer Leyland Nationals (new 1976). These Seddon-bodied Atlanteans continued their shaking ratttling movements for several more years. Their numbers dwindled slowly with the last going c.1986/87. So the Corporation must have been satisfied enough to persevere with these, in spite of any faults that there may have been. I travelled on the single-deck Atlanteans a few times up until 1976, when I left Pompey. The bodies rattled and rolled after about two years service, even on the more sturdy double-deck chassis. They were certainly lively vehicles, but one wonders why they were ever purchased for the virtually flat terrain of Portsea Island, save for Fratton and Copnor Bridges, which crossed the railway lines and were hardly vertiginous! This does raise the thought of who else bought single deck Atlanteans, I recall Great Yarmouth and Glasgow, if memory serves, not hilly places, either! The early rear underfloor engined single deckers suffered from structural problems, particularly the longer 36′ types, but this probably affected the shorter versions, such as those in Portsmouth, to some extent as well. The Panther Cub used the Leyland 400 engine, and was, I believe, generally regarded as underpowered, and not particularly satisfactory in other respects as well. So it is perhaps not so surprising that Portsmouth looked for something different for the next batch, and single deck Atlanteans would have offered the additional benefit of standardisation with the double deck fleet. The 33′ Atlanteans had a short rear overhang, so the structural problems should have been less. When it came to the later clearing out of some of the single deckers, I would imagine that the fuel consumption counted against the Leyland Nationals – although the potential ease of selling the Nationals against the "oddball" single deck Atlanteans might also have been a factor. I think that Glasgow’s single deck Atlantean was rebuilt from a fire-damaged double decker, and not purchased new as such. On the other hand, Merseyside PTE had two s/d Atlanteans, that had been ordered by Birkenhead, with Northern Counties bodies. In later years, a number of operators had old Atlantean chassis fitted with new single deck bodies, including the Southampton East Lancs bodied "Sprints". As I understand it, their performance in this form did not live up to the name! Another shot from the ‘Do You Know’ page and it appears this is not strictly a PSV, but as Peter Williamson, Stephen Howarth and Les Ronan made the effort to solve the mystery I think it only fair that their information is posted in the usual way. The above vehicle was actually operated by the Oldham Education Committee and not the Transport Department. 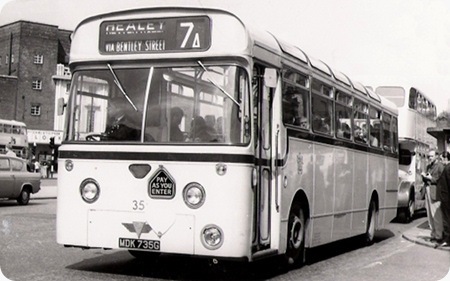 It had a two tone Green livery instead of the usual Crimson and Cream of the Passenger Transport Department but it was garaged in their Bus Depot in Wallshaw Street. It was used mainly to transport children to and from school but during the day it would take children to the local swimming baths for swimming lessons. The vehicle was sold by Oldham Corporation in 1972 and appeared in quite a few dealers before being scrapped in 1981 I suppose if it was not classed as a PSV then there would not be many buyers for it. On a personal note I was in the fortunate position of being transported to and from the swimming baths on a Maudslay half cab coach owned by Glenways of Ripponden, I can see that big ‘M’ on the radiator now, no photos I am afraid and I doubt if anyone has, but you never know!!! I thought you may like to see a front near side view of 203 FBU school bus. Was the bodywork unique? I don’t recall seeing another like it. Hi I am now resident in South Africa, Pennine was a brilliant place to work, after serving my coach building apprenticeship of 5 years at Star Bodies, Pennine was the first company to pay one pound an hour in the area so we all flocked to Pennine to work, anyway just a bit of info. Great photo of 203 FBU. I belonged to the Buckley Wells enthusiast group and later the Crossley Omnibus Society led by Stan Fitton and we had Oldham 368 kept in the Wallshaw St depot, often as not next to 203 FBU which I always remember, but being young, didn’t record any info on it, like chassis number. If anybody has it, could you post a reply please. 203 FBU was often out during the day with school parties and I remember being taken for a run around Glodwick in it by a mechanic checking that some work had been done properly. I’ve lived in Australia for over 40 years but remember this bus with its beautiful livery. No, I haven’t seen any Seddons around the world with this style of body. A few Seddons did come to Australia and a lot of Seddon Pennine 4’s went to Fiji and Malaysia but not with Seddon bodies. There are still some in service in Fiji, greatly modified, most with Leyland engines from Albion Vikings, but Seddons underneath. Of course didn’t dare attempt a photograph of 203 FBU in the depth of Oldham’s depot, that was left for professional to do with good cameras, not my crappy Bencini. So thanks to Stephen Howarth for the photos. Some Oldham buses had a distinctive "exhaust" roar 437/443/452/460 plus various M.C.T.D 3555/3557 etc, was this something to do with "Leyland Motors" as it was supplied or down to corporations experiments on power/economy measures. I lived on the "59" route at Mills Hill going up to Oldham it was a hard slog [especially on a Crossley!] regular boiling/steaming engines, often to include 433/440 /437/455. Stockport’s PD2/30 333-342 of 1958 all had a similar "bark" whilst the 1960 deliveries if the same chassis (343-352) didn’t. This unusual Seddon ran for the "230th Johnson-Hewlett Manchester Boy Scout Group" with a large roof rack, still in two-tone green. This group also owned ex Western National Bristol L5G 1743 (RTT 953) in 1976. They appear to have deregistered as a charity in 2009. I remember the chassis being tested at the Shaw Road works and when Chief Engineer RW told the driver to go, it did a wheelie down the shop. The test driver wasn’t too pleased, neither was RW but it didn’t stop them producing. This would explain the wooly steering.